Extremely flat cornea post-refractive surgery. No conventional lens will restore vision to this cornea. Only a scleral lens can restore this patient's vision. Below is the same cornea more clearly showing post-lasik ectasia. 10 years after undergoing lasik, this eye developed hydrous which is caused by a break in the interior cellular layer of the cornea rupturing. 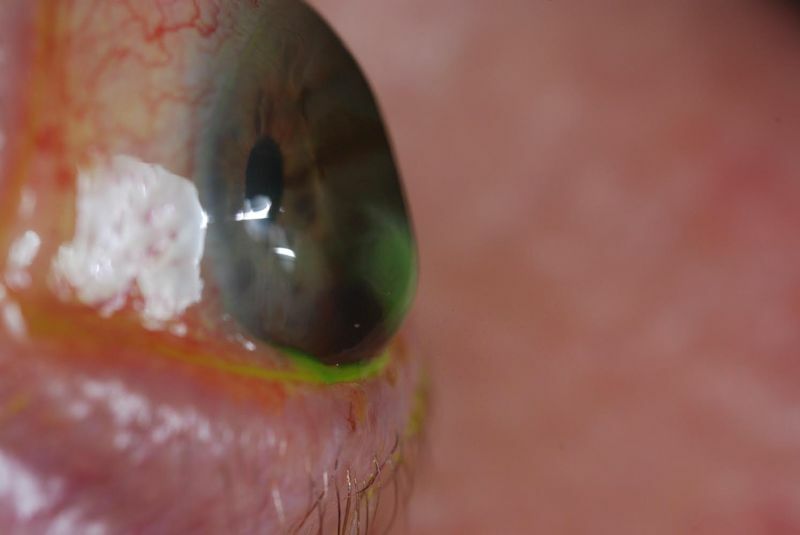 The cornea has become porous as seen by the green dye in the anterior corneal tissues. Can "new technology" fix my bad LASIK (Or Radial Keratotomy Or PRK)? Over the years I have been asked these questions many times. Currently, there are no surgical procedures or treatments that will restore the vision and comfort lost (dry eyes, reduced night vision, higher order aberrations etc.) to its pre-surgical state. If you search through the internet, you will find numerous eye care providers world-wide advertising new laser and other procedures that will eliminate the blurred, distorted vision you are now experiencing. This is just not possible. These additional refractive surgical procedures may make your vision somewhat better but they will not give you the quality of vision that you had with your eyeglasses or contact lenses before your surgery. In addition, with each successive procedure, the risk of additional complications increases significantly. I have seen many patients made worse by additional surgeries, sometimes much worse. LASIK, PRK, ALK and Radial Keratotomy (RK) are surgeries. You cannot undo the damage done by these procedures. The risk of additional vision loss is greater with each successive procedure. This is true regardless of where it is done or who performs the surgery. Since the early 1980's when radial keratotomy first appeared in the U.S., I have counseled patients not to get involved with these sight threatening surgeries. Over the last 30 years, I have taken care of thousands of patients whose vision have been damaged. The only treatment that will work to restore lost vision and ocular comfort due to refractive surgery is a gas permeable scleral lens. Scleral lenses, when fitted correctly, will replace the cornea as an optical surface. In other words, the irregular surface caused by these surgeries becomes irrelevant. These lenses vault over the compromised cornea and rest on the white portion of the eye (the sclera). 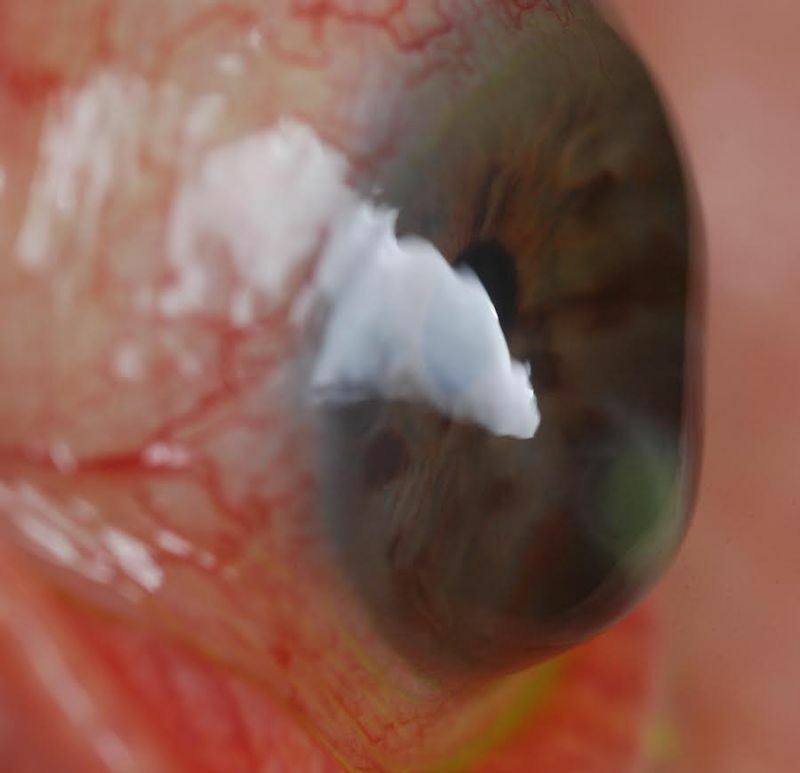 The space between the back surface of the lens and the front surface of the cornea is filled with unpreserved saline solution. Because of this, the compromised cornea is always in a wet environment which provides comfort and promotes healing. This is a computer enhanced image of a damaged cornea after LASIK, shown in 3 dimensions. Note that this cornea does not have a smooth spherical surface but instead has the appearance of what once was a spherical surface cut down the middle. There is no way that another refractive surgery will give this cornea the smooth spherical surface necessary to focus light to a point on the retina, as with normal vision. 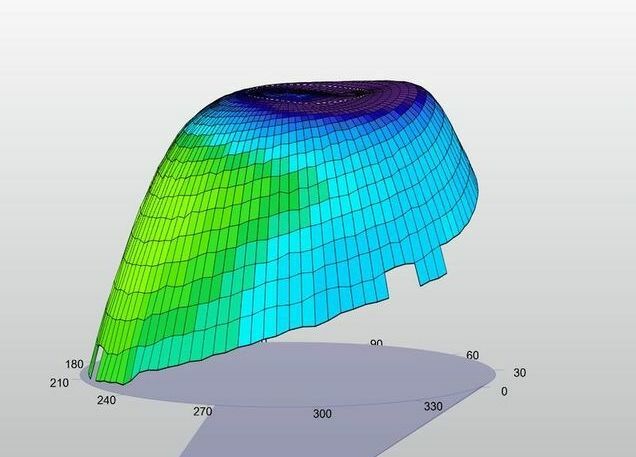 While this is an extreme case, it clearly shows the problems involved in restoring a normal optical shape to flattened Lasik corneas. The patient essentially has two options, a cornea transplant or a scleral lens. A transplant is risky and will almost certainly leave the patient needing a scleral lens anyway. In other words, the patient gains nothing from the transplant. This instrument is used to analyze the entire retina, optic nerve and optic nerve fiber layer. With this technology we are able to examine in cross-section all of the layers of the retina and macula. Very often a number of ocular diseases can be diagnosed years before any other technology is able to. A few of these diseases include, glaucoma, macular degeneration, a number of optic nerve diseases and degenerations, ocular tumors, retinal detachments and many other retinal diseases. It was not until 2011 that this specific technology became available to eye doctors.